On January 29, 1918, E.I. 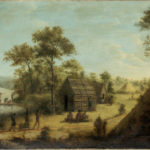 Dupont de Nemours & Company and the U.S. government embarked on building a massive factory and town along Hadley’s Bend of the Cumberland River in Davidson County. In the space of a year, Dupont created the world’s largest munition plant along with an independent company town for workers. 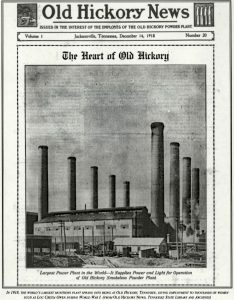 The Old Hickory Munitions Plant produced massive quantities of gunpowder – as much as 900,000 pounds a day — for the battlefields of World War I. 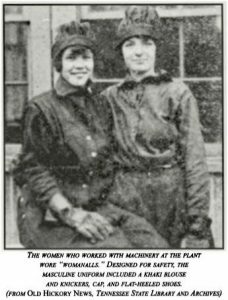 At its peak in 1918, the Old Hickory plant employed over 50,000 workers – and because of the critical need, more than 10,000 women found work at the plant. Most of the women entered into the unchartered territory of employment outside the home. 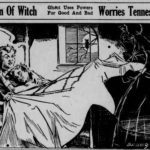 After all, just ten years before, Tennessee Governor Malcolm Patterson admonished women to stay in their place: “Let the women pray and the men vote.” But the needs of a world war shifted traditional roles. Lou Cretia Owen joined the young Tennessee women finding work out of the house and off the farm. In an effort to manage the thousands of women at the plant, Dupont hired the 22-year-old Owen in October 2018 as one of several welfare workers in the Woman’s Work Department. 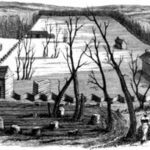 Her job oversaw anything to do with female employees, from greeting job recruits to inspecting dormitories to dealing with problems generated by what she called “the wild heart of Old Hickory. 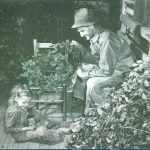 Owen, born on December 9, 1895, grew up on the family farm near Henry in Henry County, the youngest of her father’s twelve children. (Her mother, a second wife, bore seven of the children.) Little is known of her childhood, but she received a formal education, including at the county’s Liberty 4 School. She told friends that she taught school in Appalachia before coming to Old Hickory. Owen kept a diary of her time at Old Hickory, from October 1, 1918, to January 25, 1919. 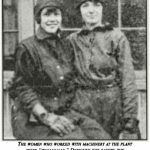 She observed that women came to work at the plant for a variety of reasons – to find a job, from desire for adventure, to escape home, out of patriotic duty. As men, the normal breadwinners, entered the war, the need to provide financial support was the greatest driver for women to seek work outside the home. She described a “shy little girl from New Orleans,” named Rosie, who “came out of an orphanage.” Rosie had “been working since she was 13, errand girl in a shirt factory.” Rosie worked her way up to inspector at Old Hickory – “This she thinks is her chance to escape from the grind of the factory life.” The plant paid an average daily income of $6, when most factories paid $3,76. 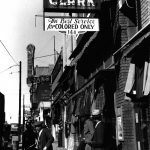 African American women workers had segregated housing and their own YMCA. Owen recounted going to a rally “held at the Colored YMCA tonight,” where the African American workers “crowded the auditorium but special seats were arranged for the white guests.” Hard work for the war effort was not enough to overcome the racial attitudes of the 1910s. The Old Hickory women enjoyed more freedom than most non-working women of the day, socializing independently with friends and pursuing the new fad of “dating.” Nevertheless, the Dupont administration frowned on alcohol consumption. 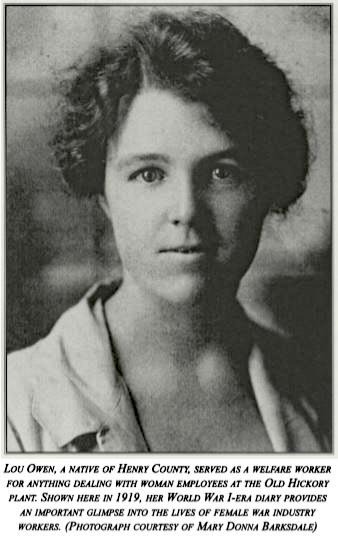 Sexual misconduct led to firings, although Owen did help dismissed girls find places to live and treatment for sexually-transmitted disease. 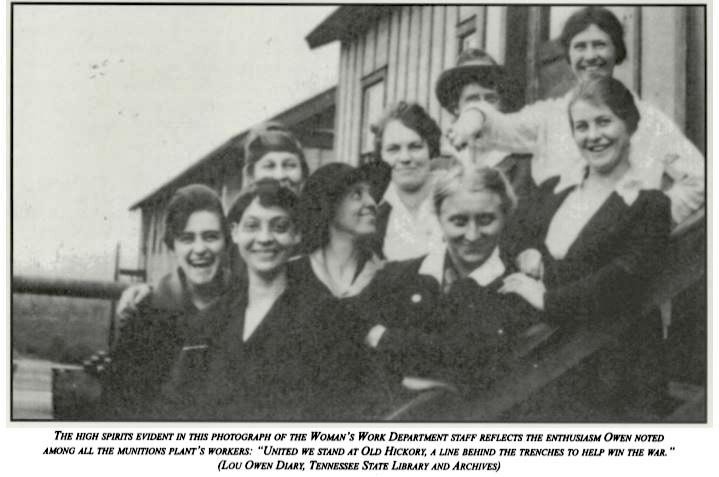 In general, however, the life of Dupont’s women workers was similar to that of the women’s dormitory life that college coeds would enjoy after the war. Lou Cretia Owen through her diary gives us a rare window on the life of women workers at the worlds’ largest munitions plant during World War I. 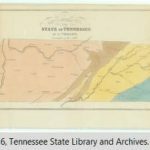 She donated the diary in 1933 to the Tennessee State Library and Archives. 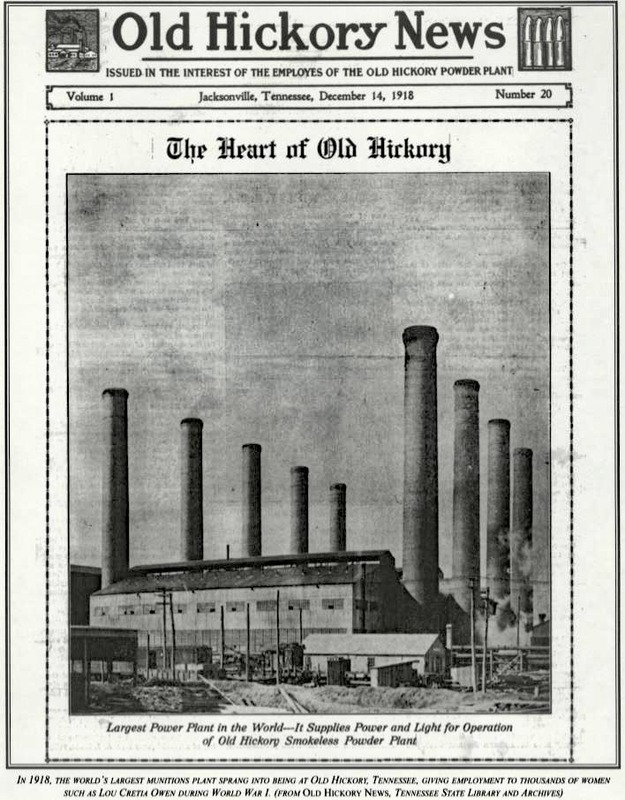 If you’d like to read more about Owen and the women of Old Hickory, an article from the Summer 1999 Tennessee Historical Quarterly – “Lou Cretia Owen and the Old Hickory Munitions Plant during World War I” – can be found at this link.